Foamed or frothed milk is used in many espresso drinks and other hot beverages. With some practice, you can make fantastic foamed milk for cappuccinos, macchiatos, tea lattes, and other drinks. Frothing milk with an espresso machine is very easy. Most machines (including many automatic machines) include a steam wand that hangs off the side. This attached arm simply forces steam into your milk, gently warming it with pressure. At the same time, it adds air to the milk, which causes it to froth (or foam). You also will need a small metal pitcher for frothing. These are called milk-frothing pitchers and they are available at many stores that sell espresso machines and accessories. They are a perfect depth for the steam wand and the long handle is easy to hold and control. 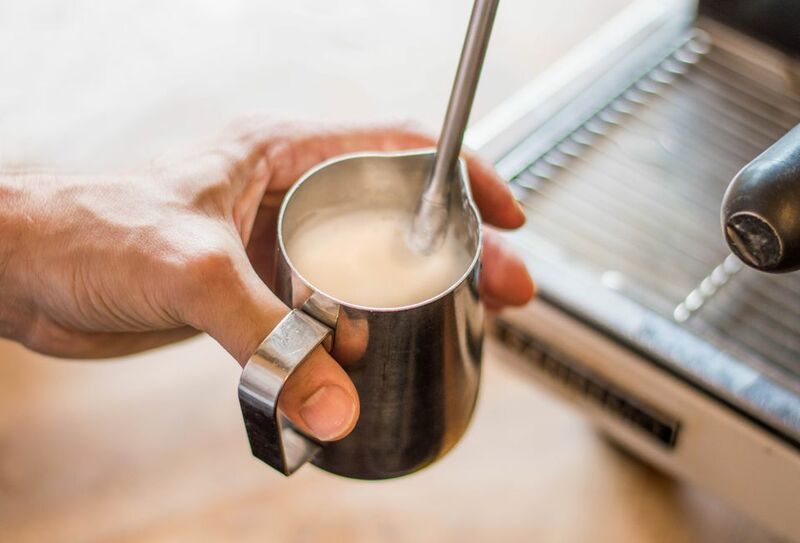 The exact methods for frothing milk vary slightly based on the drink, but this technique includes the basics for this style of texturized milk. Pour fresh, cold milk into a small metal pitcher. Engage the steam wand on the espresso machine. Insert the steam wand into the milk, just below the surface. Keeping the tip of the wand near the side of the pitcher, create a vortex in the milk. Move the pitcher so the steam wand is higher, lower, closer to the edge or further from the edge in order to incorporate air into the milk and break up larger bubbles. The bubbles should get progressively smaller. Once the mixture has increased in size substantially (about double the volume for a cappuccino or 1 1/2 times the volume for a latte), remove the wand from the pitcher. The texture of the milk should be smooth (not pixelated) and similar in appearance to melted ice cream. Immediately pour the foamed milk into your espresso or other drink, leaving some in the pitcher. Create latte art while you pour if desired. If there are a few large bubbles remaining on the surface of the frothed milk, tap the pitcher firmly against a countertop or similar surface, then swirl the milk around the pitcher. This trick generally removes larger bubbles. The longer you wait to pour the milk, the more the texture of the milk begins to break down. Leaving some milk in the pitcher ensures that you are pouring only foam and no un-texturized milk. Clean your steam wand after every use as it is a convenient place for bacteria to grow (especially from milk). To do so, fill the frothing pitcher with water and run the steam wand as if you were frothing milk. Run a second batch of clean water to ensure you get it nice and clean. If you do not have an espresso machine or yours does not have a steam wand, you can foam milk on the stovetop. To do so, pour your milk into a small saucepan, gently add heat, and whisk hard, fast, and constantly until the milk foams. Be careful not to scorch or scald the milk.